You may be wondering why it's July 8th where you are and only July 3rd where we are. We'll, we're finally in the vacation time zone where people do things at a much more reasonable pace, like connecting to the internet once or twice a week instead of the usual 24 x 7. The withdrawal was horrible, but now that we've entered the zone, we're usually out and about. When we get back, we eat, maybe read a little and go to bed. Such a simple formula... why can't we do that at home? * Route 66--Route 66 is a big deal here in Oklahoma. 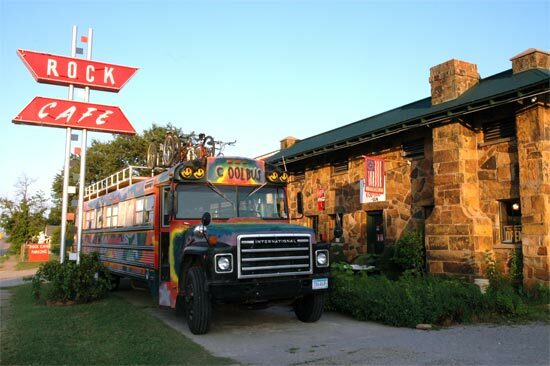 Unlike Missouri, a state that seems to care less and maybe forgotten about the fabled route, Oklahoma touts it's many Route 66 attractions, including an assortment of restored filling stations, old cafes and other oddities like the Blue Whale and the Round Barn. The tourism bureau here had a zillion brochures and was staffed by folks who knew the answer to everything about having fun in Oklahoma... a good thing for us, since coming from a state that's over saturated with recreational activity we have difficulty imagining Oklahoma as a serious destination for adventure. * The Blue Whale--We decided to check out a couple of the favorites. First the Blue Whale. This is basically one of the first original water parks, where you could walk into the giant open mouth and slide into a swimming hole that had been used by locals and visitors passing through on Route 66 over the years. The whale has been recently restored, but swimming is forbidden. It looked a little too swampy anyway, but the heat did tempt us to accidentally fall in. * Rock Cafe--The highlight of the day was Rock Cafe in Stroud. This is the kind of roadside cafe of dreams. We drove up as the sun was casting long shadows and the small, finely crafted stone building glowed as if lit up for a movie shoot. A single bus sized parking space awaited us, right in front. Arriving at such a cool cafe on the Cool Bus, was a big hit with our waitress, Tiffani, who loved the bus and treated us like old friends. (Seems like half the people we meet along our route would love to be on a trip on the Cool Bus, many instantly confessing to be old hippies or having owned a VW bus years ago, which qualifies them as fellow bus owners... the other half wonder if any redneck cops have pulled us over yet.) Inside the small, well-worn cafe only a couple of people occupied what appeared to be their own personal seats at the counter. A second counter off to the side was waiting just for us. A round of creme sodas and 'Root 66 Beers' took the edge off the warm humid day, then we dived into bacon cheese burgers and boiled shrimp and crawfish without coming up for air. * The art of shifting--Oklahoma is a little hillier than I thought it would be, big long, rolling hills, and anything that even smells like a hill, slows our bus to a crawl. I'm finally getting the hang of shifting a split-axle, which is not much different than a 10 speed bicycle, except that we have 2 gears in the back and 5 up front. The trick is to figure out where the 'good' gears are, since some overlap occurs, just like on a bike. For example, there's no point in shifting to the low axle in 5th gear, since it's just about the same as 4th with the high axle. So, down shifting from 5th on an up hill, it's best to go to 4th, then, if needed, shift to the low axle in 4th, and, if things really start dragging, do the fancy double shift to 3rd and the high axle at the same time. The axle is shifted by pushing or pulling a red button on the shift lever, that's mounted just below the shift knob. On this bus, the axle is vacuum actuated, so there's a second or two lag before the axle actually shifts. Push the clutch, pull the knob, count 'one thousand, two thousand, then release the clutch and hope the axle has shifted. Sometimes it doesn't and you end up between gears. It feels like your chain just came off, with the added excitement of a couple of flying semi's coming up behind you.